At Tuned in Cabling Solutions the intention is simple; to bring new levels of expertise and good old fashioned friendly service to the TV Reception & Cabling industry throughout Brisbane and the Gold Coast. Our aim is to provide solutions for your home cabling requirements. We will work hard to achieve the optimum results for you. We will give you full instruction on how to use your digital products and at the end of the job we will clean and remove any mess. Tuned In cabling Solutions are your local specialists servicing all your cabling and digital TV needs. Tuned In is headed by Mathew Robins, a specialist in the industry with two decades of experience. Mathew has watched the industry evolve over this time and has followed closely the dramatic new changes occurring with the changeover to digital television. Hi-Fi and Home Theatre have long been a passion of Mathew’s. Home Theatre systems are now a very common inclusion in any house, and having that Digital Television integrated in with the Home Theatre System can bring an in home cinematic experience. By having all of your components set up properly by Tuned In Cabling Solutions, that Grand Final can almost feel like it is taking place in your living room, or that movie experience can be more enjoyable than a session at the cinemas. Mathew spent six years with Jim’s Antennas in varying roles. Mathew successfully established two franchises in this time, and also worked in a National Training role for Jim’s Antennas. Mathew successfully trained many Jim’s Antennas franchisees, as well as taking on management roles supervising national programs. During this period, Jim’s Antennas were also performing installations for JB Hi-Fi. Home Theatre training became essential for any franchisee, and Mathew helped new franchisees develop their skills in Home Theatre Installations. Mathew also trained franchisees in all facets of TV antenna installations, from standard antenna systems through to 40 & 50 ft masts. Mathew established Tuned In Cabling Solutions in 2009. As the switch off date for Analogue Signal approaches there is certainly a market need for quality installations. Tuned in Cabling solutions is proudly a Government endorsed company as well as being registered with Freeview Australia. We can help you bring your house successfully into the Digital era, and our intention is always to offer an honest and accurate service. We will always work hard to fix your reception issues the first time, as well as offering a dependable back up service. Tuned In Cabling Solutions is proudly an Australian Company. With Tuned In, you are guaranteed to receive the right solutions for all your television and cabling needs; isn’t it time you contacted the experts. 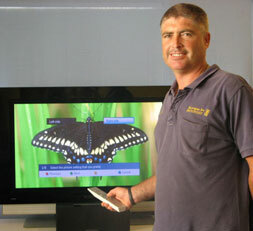 Tuned In Cabling & Antennas – Servicing the Gold Coast and Brisbane and all Suburbs inclusive.